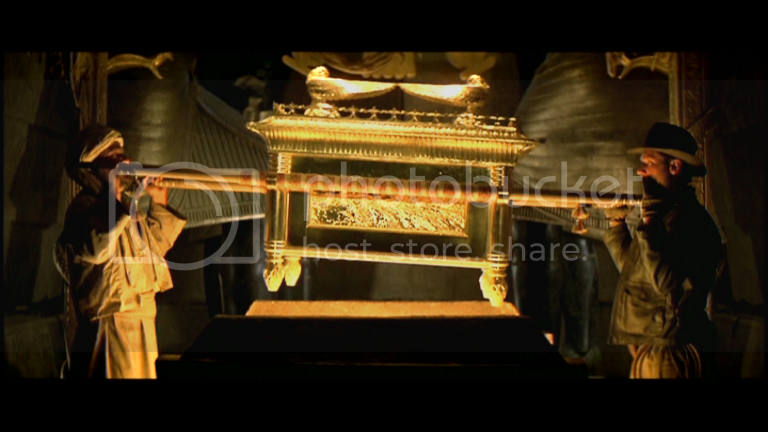 The Ark of the Covenant is an artifact associated with Jewish, Islamic, and Christian faiths. Depending on the source, the Ark holds the Ten Commandments, a staff that once became a snake, a portion of the Torah, and more. After the Babylonian siege of Jerusalem in the 6th Century B.C.E. (sic), the Ark of the Covenant disappeared from religious records. Where did it go? Here are eight incredible, conspiracy-minded theories. 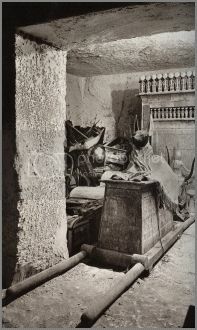 A 1922 picture of the early excavation of the tomb of Tutankhamun shows an object, the Anubis Shrine, fits the description of the Ark of the Covenant. Shortly after photographs of the excavation spread, a small group of archaeologists to claim the artifact is indeed the Ark. After inspecting the artifact, however, the dimensions of the Anubis Shrine do not match the purported dimensions of the Ark of the Covenant as described in religious texts. 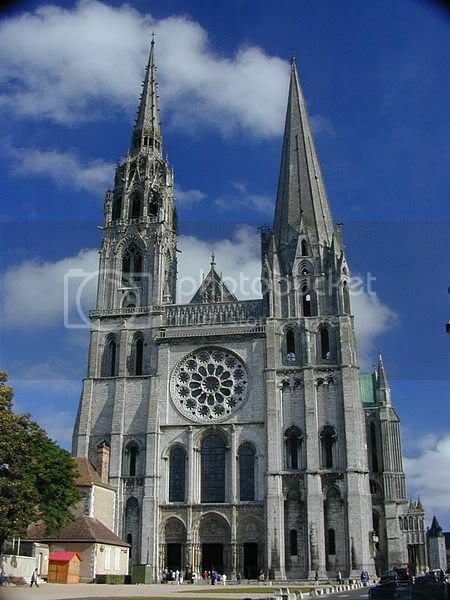 An extremely well preserved 12th Century cathedral, Chartres Cathedral is best known for the two unusual spires straddle the building and reach a height of over 340 feet. In the book Mysteries of Chartres Cathedral, Louis Charpentier suggests Templars found the Ark of the Covenant during the Crusades and placed the Ark within the cathedral for safe keeping. The current caretakers of the Chartres Cathedral do not make any claims to possession of the Ark of the Covenant. In an account written within the second book of Maccabees, an account of Jewish history during the Babylonian captivity written in Greek during the 2nd Century B.C.E. (sic), suggests the Ark narrowly survived the Babylonian siege. According to 2 Maccabees, the prophet Jeremiah hid the Ark and several other key objects in a cave within a mountain in Jordan prior to the Babylonian siege, hoping to protect the artifacts forever. 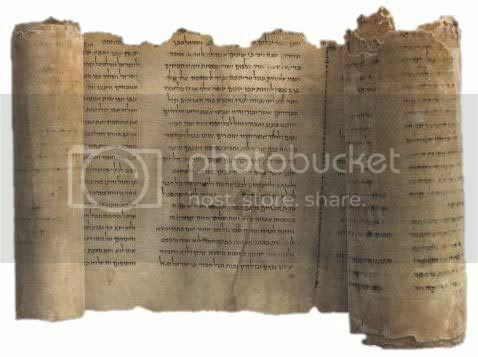 Amongst the Dead Sea Scrolls unearthed in the late 1940s, archaeologists found one scroll featuring writing along a thin piece of copper scroll. When translated, the scroll cites sixty-four locations containing treasures of gold and silver. One of these locations could lead to the Ark of the Covenant. The Lemba reside in South Africa, particularly Zimbabwe, and claim to be the "lost" tribe of Israel. A 1999 DNA survey links the Lemba to priestly families in Israel, lending a small amount of evidence to this claim. The Lemba treat their Ark in accordance to the religious tenets prescribed for the Ark, carrying it on poles and avoiding contact with the chest. Currently, a replica of the Ark of the Covenant is held at the Museum of Human Science in Zimbabwe, with the Lemba claiming the 700 year-old replica is created from the core of the original Ark of the Covenant. The Chapel of the Tablet at the Church of Our Lady Mary of Zion in Axum, a city in Northern Ethiopia, claims to have the Ark of the Covenant. 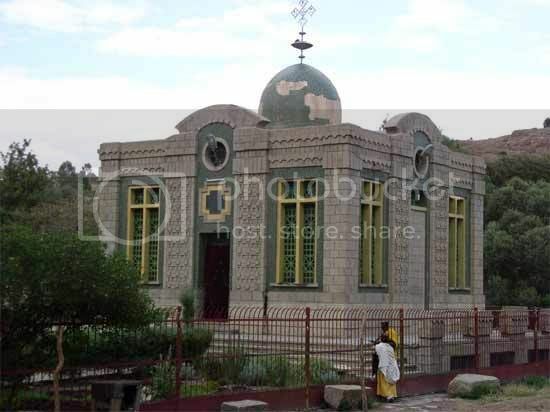 The Ethiopian Orthodox Church places copies of the Ark within every affiliate church in Ethiopia. The tale by which the Ark reached Northern Ethiopia is interesting, as the church believes Menelik, the child of Solomon and the Queen of Sheba, absconded the true Ark of the Covenant in the 13th Century B.C.E. (sic) and took the Ark to Ethiopia, leaving a clever fake in its place. Lake Tiberias, also known as the Sea of Galiliee, is thought by a group of Shia Muslims to be the current resting place of the Ark of the Covenant. 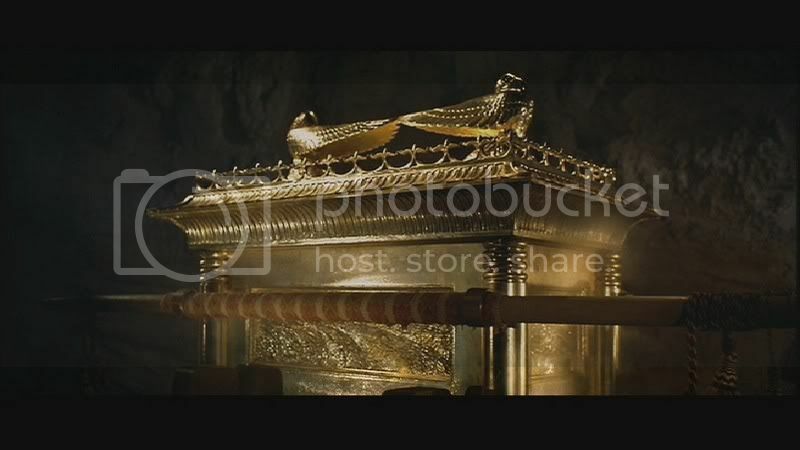 One Shia sect of Islam puts credence in a Hadith (these are most commonly sayings attributed to Mohammed or commentary on something he did) that states the Ark of the Covenant will rise from Lake Tiberias. There is catch, however — the Ark will only be discovered after the rise of Mahdi, who will rule the Earth for a disputed time period prior to the Day of Judgement. 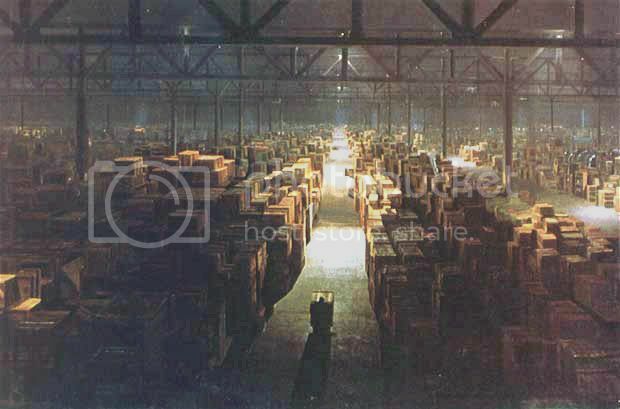 This hiding place lacks substantial evidence, but the idea that the Ark of the Covenant is held in a nondescript crate deep in a government warehouse snuck into popular culture thanks to the Indiana Jones series and the nature of shows like Warehouse 13. Is one of history's most sacred objects tucked away anonymously in an unknown government location? No evidence supports this resting place, but it makes for a fantastic plot point. Frame an Ark of setim wood, the length whereof shall be of two cubits and a half: the breadth, a cubit and a half: the height, likewise, a cubit and a half. And thou shalt overlay it with the purest gold within and without...And four golden rings, which thou shalt put at the four corners of the ark...Thou shalt make bars also of setim wood, and shalt overlay them with gold. And thou shalt put them in through the rings that are in the sides of the ark, that it may be carried on them... Thou shalt make also two cherubim's of beaten gold, on the two sides of the oracle. Let one cherub be on the one side, and the other on the other. Spreading their wings, and covering the propitiatory, and looking one toward the other, and towards it. "The Ark was to consist of a chest made of acacia wood two-and-one-half cubits long (about 45 inches), one-and-one-half cubits wide (about 27 inches), and one-and-one-half cubits in depth. This was to be overlaid inside and out with pure hammered gold. It was to function as the repository for the two Tablets of the Covenant (the Ten Commandments). A cover, of the same length and width, was to be made for this chest, also of pure hammered gold, called the kapporet. 2 Joined to it were to be two winged figures of pure hammered gold, called cherubim. 3 Finally, four rings, cast in gold, were to be attached to the four corners of the chest, into which two gold-plated acacia wood poles of indeterminate length were to be inserted so that the entire object could be carried. A coronet of hammered gold was to embellish the tops of the four sides of the chest. The intent was that several men, at least four, would carry the Ark on their shoulders." If found ... open with caution. I think there is a possibility that priests knowing the temple was about to be captured, hid it somewhere. It probably will never be found. Also possible that it ended up in in Ninevah or Babylobn and then was probably eventually captured by Alexander’s men or maybe destroyed for it’s precious metals soon after it was originally taken. Also in the Dome of the Rock in Jerusalem—in a hidden cave. It used to sit in Obed-Edom’s garage. It’s probably in another similar place hiding in plain sight. Why do you think the Muslims are excavating the Dome? They want to find it and destroy it. 4 These same records also tell us that Jeremiah, acting under divine guidance, commanded the Tent of the Lord’s Presence and the Covenant Box to follow him to the mountain where Moses had looked down on the land which God had promised our people. When Jeremiah got to the mountain, he found a huge cave and there he hid the Tent of the Lord’s Presence, the Covenant Box, and the altar of incense. Then he sealed up the entrance. I fully expect someone to bring it into the shop one night on "Pawn Stars":RICK: "What have you got there?" CUSTOMER: "The Ark of the Covenant." RICK: "Where did you get it?" CUSTOMER: "I picked it up at a garage sale. My wife's been bugging me to get it out of the garage." RICK: "Yeah, well, before I can make you an offer, I'll need to bring someone in to authenticate it.....Chumley! Get the Pope on the phone!" It was moved to the Island of St. Croix in the Caribbean by the Knights of Malta. What if it’s not really hidden anywhere? What if... it’s just a piece of a story and never truly existed in a physical form? Isn’t that within the realm of possibility? Top men are on this. Top men. Will you please cut to the chase and tell us...and save us having to listen all 11 video’s by this John the Baptist wannabe, or whatever he thinks he is? I don’t believe that God would have allowed it to be destroyed. The Mafia buried it under the Meadowlands. ...associated with Jewish, Islamic, and Christian faiths...Pretty bizarre claim given that it disappeared hundreds of years before Christianity and around a thousand years before Islam. I would like to know how it became associated with “the islamic faith”. There’s simply no end to the garbage from these neanderthals. Yeah well, I’m not gonna open it. Too heavy, sitting here between all the .22’s and the ten kiloton nuke. But now it will all have to be lost in a regrettable boating accident. The Romans didn't get it. I personally believe that it was placed beneath the Holy of Holies during the construction of the first temple where it remains to this day.I was also told by a buddy who researched the Ark some years back, that an elite team of Israeli commandos went to Ethiopia back in the early 2000’s aboard a C130 transport and supposedly left with a very important artifact. Each one of these commandos were descendants of the tribe of Levi. I still don't think the Ark has left Israel since the days of Soloman. 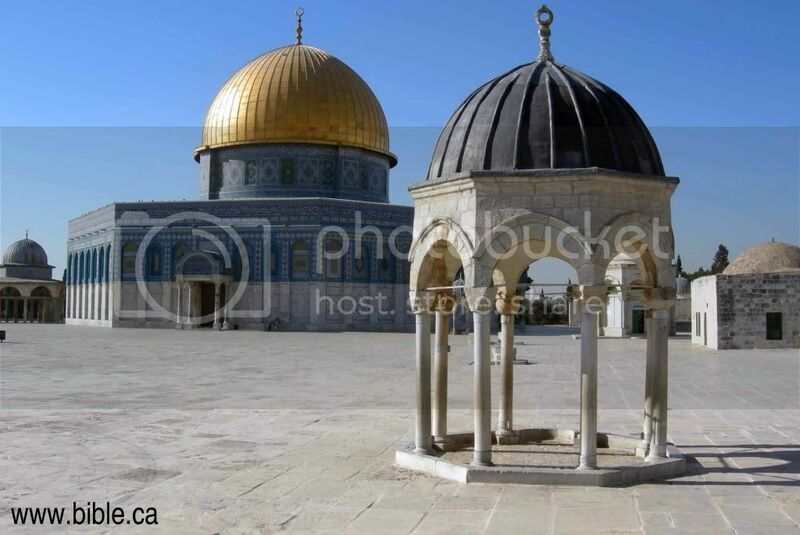 This is the Dome of the Spirits and many believe that this is the place of the original temple built by King Soloman known as the Holy of Holies. Beneath it is the speculated resting place of the Ark of the Covenant. I find his theory very intriguing. It centers around the blood of Christ anointing the right side of seat of the Ark. He believes the Dome of Spirits is the secret entrance to a subterranean passageway leading to where the Ark is hidden. Rood further suggests that the earthquake that occurred at the time of Christ's death, created a crack at the site of the Crucifixion that allowed Christ's blood which flowed from a Roman soldier piercing his side, to fall onto the right side of the Ark hidden directly below the site of the Crucifixion.That would be miraculous! More likely, the blood of Christ, collected in a challis, was indeed used to anoint the Ark by those of the day who knew its secret location. May sound far out, but he has put a lot of research into his theories and there seems to be evidence that backs many of his claims. What if it’s not really hidden anywhere? What if... it’s just a piece of a story and never truly existed in a physical form? Isn’t that within the realm of possibility?Not really a Bible believer, are you? I wouldn’t consider myself an atheist, but I have grown more skeptical of many things we’ve been told in life, whether in the realm of religion or elsewhere. On the whole, I believe that religion is a positive influence on many people’s lives and that’s a good thing. I also believe that the “separation of church and state” zealots tend to be crappy people that should adopt a live-and-let-live attitude instead. But faith, in and of itself, isn’t enough to answer the many questions and concerns I’ve had over the years. And for those of you who believe wholeheartedly in everything the Bible says, good for you. I’ll bet that if we ever meet face to face I’ll probably think you’re wonderful people. I wouldn’t consider myself an atheistNot really a theist either, are you? You either are or you aren't. more intersting is what was in it and how it was used. ...”At the time when the Holy Ark was hidden away, they also hid the Shemen HaMishcha, the jar of manna, etc.” (Horayot 12a). What if it’s not really hidden anywhere? What if... it’s just a piece of a story and never truly existed in a physical form? Isn’t that within the realm of possibility?No. Not really. No more then the Colossus of Rhodes "never existed in physical form". In fact we have less evidence for the Colossus then we do for the Ark. The most likely consideration is that it no longer exists anywhere. There is no reason to believe anything to the contrary. The Dimensions quoted are likely close but not exact. 2.5 cubits / 1.5 = 1.6666 Near but not right on the Golden Mean of 1.618. I would guess the height and width dimension is 2.5/1.618 = 1.647 cubits or 1 cubit 14 .55 fingers. Interesting theories- some wacky, some far-fetched, some plausible. When the good LORD decides we should find it, it will be found. Read the Sign and the Seal. The Ark disappeared from Biblical reference during the reign of King Manasseh. Manasseh profaned the Holy of Holies in the Temple with pagan images. The presence of pagan idols next to the Ark of the Living God would have been the worst of blasphemies. The Levites spirited the Ark out of Jerusalem at this time long before the Babylonian captivity and took it to Lake Tana in Ethiopia. From there it wound up in the Church of St. Mary in Axum. I believe this. 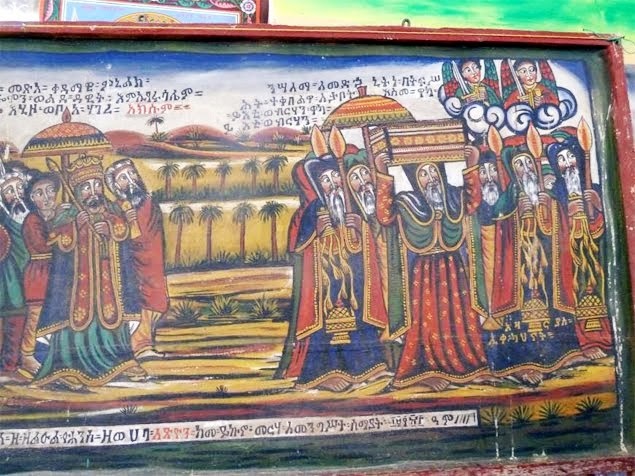 There are too many weird connections with the Ark in the Christian Orthodox Church of Ethiopia and Manasseh was the most evil of the kings of Israel. The story about the Queen of Sheba and Menelik is probably apocryphal. I wouldn’t go anywhere near it. Only very holy hands should touch it. The most likely consideration is that it no longer exists anywhere. There is no reason to believe anything to the contrary.Nor is there any spiritual reason for it to exist any more. ALL the things built by Moses were shadows of, and patterned upon, the REAL items in Heaven. The exception was the Tabernacle, which was a temporary, portable structure for use until the earthly Temple would be built at the designated place; that Temple itself was a shadow of the Heavenly Temple. Jesus, having nailed the blood ordinances to the Cross with His sacrifice; and having rent the veil of the Holy of Holies, has made obsolete all of the Temple furniture (and, indeed, the Temple itself: "in three days, I will rebuild...": He is our temple.) related to sacrifices, or the need for an intermediary (earthly High Priest) to approach the Mercy Seat on our behalf. He is now our High Priest, and all can openly approach Him. Like the brazen snake on the staff that Moses was instructed to make in the wilderness later did, there is every danger that the Ark and other artifacts would become objects of idolatry, being worshiped in their own right. Indeed, we see much of that mind set already, even though the Ark has no verifiable physical existence; and to a lesser extent, we also see it in the Shroud of Turin. God hates idolatry, and I have no doubt that he would have long since removed these items as the potential stumbling blocks that they are. The real Ark is in Heaven, in the real Temple. www.geghna.org. Awesome Inc. theme. Theme images by molotovcoketail. Powered by Blogger.